Grace Brethren Florida church-planter Kirt Henman (pictured) and the gas discount his church is offering are currently being featured on a FOX News Channel in Orlando. Here is an excerpt–to see the original click here. Henman has also been interviewed by the Orlando Sentinel for a potential article. (WOFL FOX 35, Orlando) — Fed up with the high gas prices? 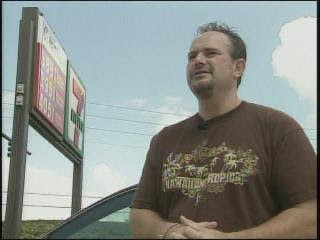 A central Florida church says it wants to bless you by giving you a discount on gas. For a few hours on Saturday the members of the New Spring Church will pay $.50 cents of every gallon sold at the 7-11 on Red Bug Lake Road. It’s certainly a smart way for their new church to get its name out but Kirt Henman, pastor of New Spring Church says it’s not the main reason why they’re doing this. And Henman says there’s no lecturing, either. i do appreciate new spring's desire to reach out to the community. i know their desire is to attract attention for Christ's fame, not their own. however, i do have to wish they won't be able to hold to their word. simply giving gas to people may not be serving them. what if that gas is used to indulge fleshly desires? what if the money saved from the gas is used toward sinful activities? what if a non-believing person wrongly interprets this gift as a sign that they are in God's right standing? i pray that the gas buy down is a smashing success. like the woman at the well, i pray they come for their physical needs (or wants) but are drawn to the more necessary spiritual need. but for that to happen, preaching will have to happen. please, unashamedly preach!!!!!!! and may God bless the casting of the seed!